On May 24, 2017, Florence Knoll Bassett—known throughout her life by her friends as "Shu"—turns 100 years old. This is her story. Florence Margaret Schust was born to a baker in Saginaw, Michigan in 1917. Her rise to the top of the design world began in tragedy when she was orphaned at age 12. Fortuitously, her guardian brought her on a tour of possible boarding schools, among them the recently opened Kingswood School for Girls in Bloomfield Hills, Michigan. The school was designed by Finnish architect Eliel Saarinen; at the time, he was also headmaster of the Cranbrook Academy of Art. 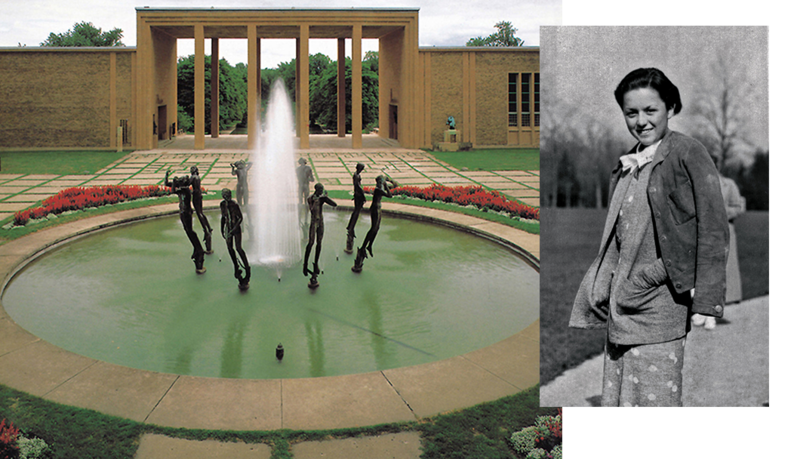 At Kingswood, Florence Knoll developed an interest in architecture and caught Eliel Saarinen's attention. 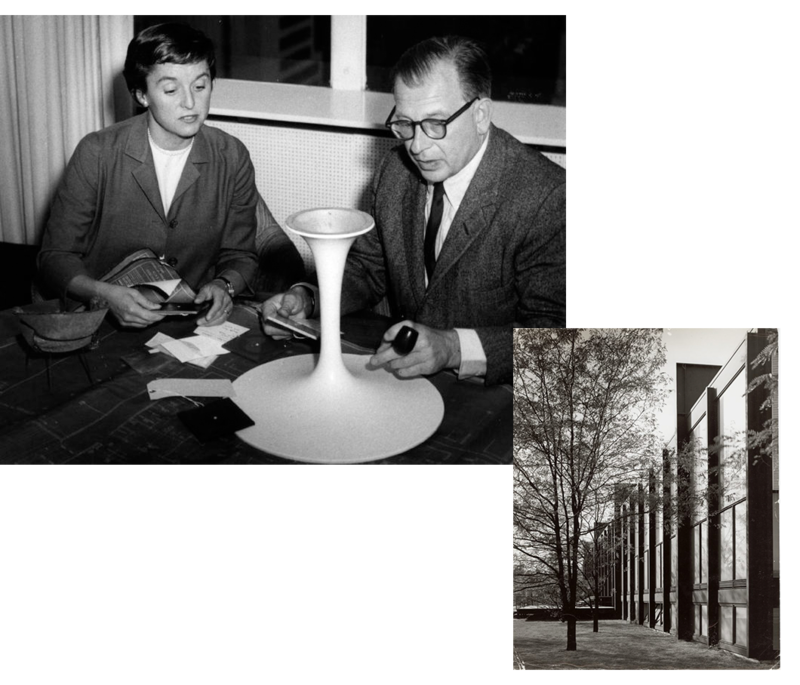 Over time, she became an extended part of the Saarinen family, which included Eliel's son Eero Saarinen, who would go on to become a distinguished architect. 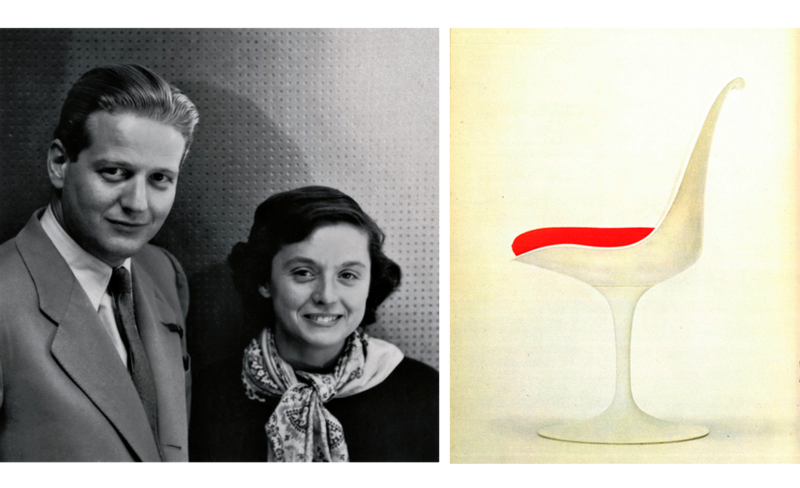 Shu and Eero became lifelong friends and she would later commission him to design a collection of groundbreaking furniture for Knoll. Upon graduating from Kingswood, Florence enrolled at the Cranbrook Academy of Art, the beginning of her years of serious design training. There, she met Harry Bertoia, who would also eventually collaborate with Knoll on modern furniture designs. Florence Knoll went on to study at the Architectural Association in London, but the outbreak of World War II brought her back to the United States, and she completed her formal training at what is now the Illinois Institute of Technology in Chicago. During these formative years, Florence Knoll met many of the leading architects of the time, including Alvar Aalto, Marcel Breuer, Walter Gropius and Ludwig Mies van der Rohe. Some of these early mentors would come to figure prominently in her future work at Knoll, but it was Mies who had perhaps the clearest influence on her signature approach to design: rigorous and methodical. Aiming to pursue work in architecture, Florence moved to New York City and there met Hans Knoll. Hans Knoll was the third generation of a Stuttgart-based furniture manufacturing family, and he sought to bring European Modernism to a new audience in the United States. The pair began working together, and soon Florence Knoll was taking an increasingly significant role in the company’s aesthetic development, in addition to her official role designing office interiors. Before long the two were business partners, and in 1946 the pair married, renaming the company Knoll Associates. Florence Knoll soon became inextricable from the company's advances in the industry. She broadened the company’s existing array of furniture offerings to eventually include the work of some of her Cranbrook colleagues as well as the prominent Modernist figures who had influenced her critical eye. 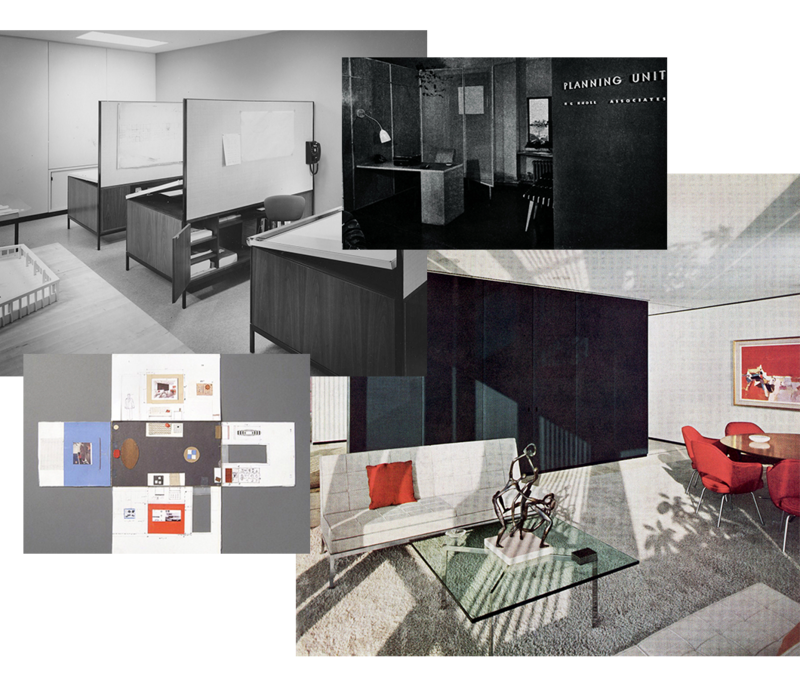 These pieces became iconic of the corporate interiors of the post-war period and remain timeless designs to this day. In 1945, Florence Knoll established the Knoll Planning Unit, an interior design division of the furniture company that set the standard for the mid-century modern interior. “The Planning Unit began when I joined Hans Knoll at 601 Madison,” recalled Florence Knoll. Florence Knoll’s meticulous methods of assessing a client’s needs and patterns of use were clear in her sketches, annotations, and especially the "paste-up" cardboard models she used to demonstrate envisioned spaces. A unique visual planning technique, her paste-ups would feature folding walls, drawings of the furniture and fabric samples of the upholstery, all accompanied by detailed notes. Throughout the 1940s and 1950s, Florence Knoll also designed individual pieces of furniture—foils to the more sculptural designs she commissioned with her exacting taste from the likes of Eero Saarinen, Harry Bertoia, Isamu Noguchi and George Nakashima. Responding to direct needs encountered while working on projects and finding the market lacking, Florence Knoll designed seating, tables and case goods. Over the years, Florence Knoll designs, which she had conceived as background architecture, have proven to be design classics all their own. In 1947, Florence Knoll launched a textile program to fill another gap she perceived in the market for contract furniture upholstery. This would later become KnollTextiles. "It became apparent to me that suitable textiles were not available for our furniture and interiors," Shu wrote. A separate Knoll showroom devoted entirely to textiles opened on East 65th Street, initially including fabrics intended for men's suiting sourced from Shu's time at the Architectural Association in London. 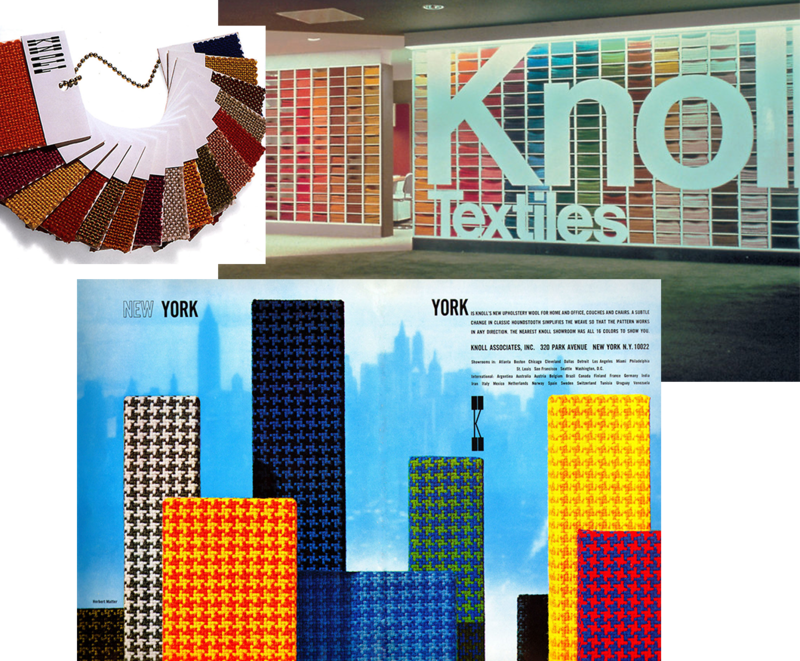 Eventually, KnollTextiles would develop several signature fabrics that set the benchmark for the contract market. Shu's use of small fabric swatches—the simple but effective practice of stapling fabric samples to pieces of carboard—in client presentations led her to develop a tagged sample and display system that eventually became an industry standard. Working with Swiss photographer and graphic designer Herbert Matter on the Knoll showroom at 601 Madison Avenue, Shu developed a gridded textile "wall" and fabric "tree" as methods of presentation that eventually became widespread across Knoll showrooms and those of Knoll’s competitors.